Toyota Motor Sales, U.S.A., Inc. (TMS) is the Toyota sales, marketing and distribution subsidiary devoted to the U.S. market. Founded in California in 1957, TMS employs more than 6,500 people. Its headquarters in Torrance, California supervises 14 regional offices. TMS oversees sales in all 50 US states for Toyota, Lexus and Scion brands. Leveraging a network of over 1,200 dealers, TMS develops Toyota’s television campaigns and other nationwide marketing materials and supervises dealer marketing to ensure that dealers present a uniform image. TMS also manages regional distribution, which occurs through twelve parts centers and five vehicle centers. Founded in California in 1957, TMS employs more than 6,500 people. The IT infrastructure for TMS had grown substantially over the years along with the growth of the company. Significant numbers of applications were implemented with dedicated infrastructure, which resulted in a large footprint of UNIX servers with inefficient capacity utilization comprising over 300 HP and Solaris servers. This large, inefficient server structure resulted in a high cost of ownership for support, operations, data center and licenses. In addition, most of the servers had reached the end of their lifecycle. TMS management was faced with the challenge of reducing the total cost of ownership. OSI proposed leveraging new technology in order to reduce the number of servers, thereby creating better performance, improving capacity utilization and expanding reliability. TMS needs were addressed using the following methodology: Discovery/Inception Phase, Elaboration Phase, Construction Phase and Migration Phase. The OSI team was comprised of eleven technical resources with expertise in Solaris, HP, Weblogic and Oracle database. The project was managed by a dedicated OSI program manager working closely with TMS Project Management Oracle. 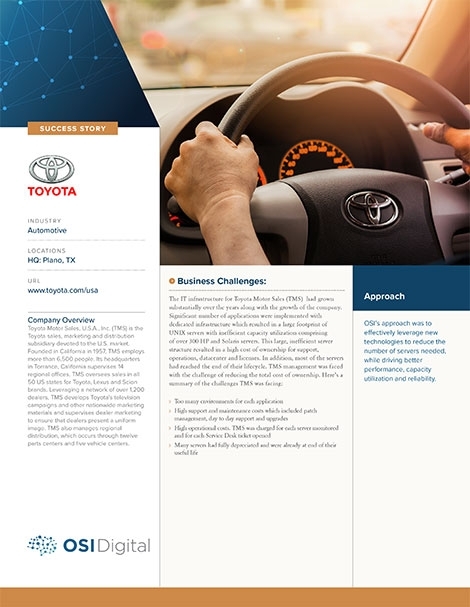 OSI’s approach with Toyota was to effectively leverage new technologies, while driving better performance, capacity utilization and reliability.